A series of posts documenting the making of my wood-fired ceramics. It’s been a hectic month with exhibitions and shows to get ready for and consequently I’ve neglected the blog somewhat. Now that things have calmed down a little, I have found some time to sit down and write about the final stage of the whole ceramic process. This is the moment when all the weeks and months of hard work culminate in intense heat. 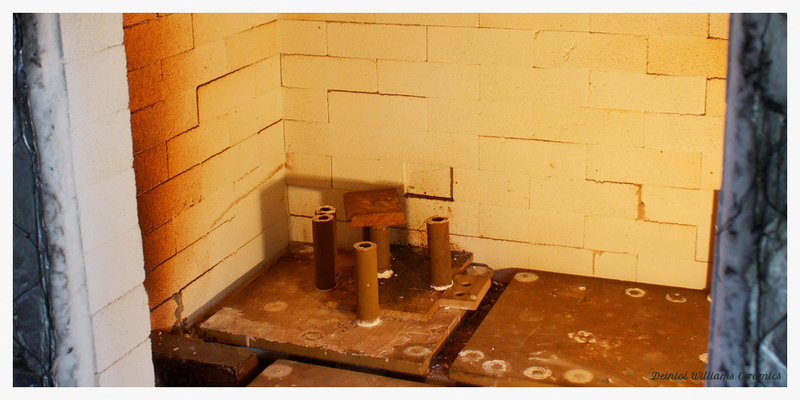 A crucial part of the wood firing process is the packing of the work in the ware chamber. How and where each piece is placed affects the flame path and also how the kiln fires, and as a consequence how the work will finally look. With many different factors to consider it can sometimes feels like a huge complicated jigsaw. In this post I'm going to show how the pots are glazed and how I prepare the wood kiln ready for packing. At this point I will have travelled down from my studio in Yorkshire to the family farm in West Wales. I spend about 2-3 weeks glazing, preparing the kiln, packing, firing, and unpacking the kiln before heading back up to my studio in West Yorkshire. This post is a bit later than I had planned but it's been really busy at the studio getting all the work made and dried in time ready for the wood-firing. In this post I'll show how I make my large chargers and slabbed platters. News of upcoming events, developments in the studio, and reflections on art and ceramic.